The fall season is taking its last breaths here on Jeju Island. Red and yellow maple tree leaves try to outshine each other and the Okse grass dances in the chilly wind: The perfect time to go hiking along the Jeju Olleh Trail or to have the last picnic at the beach before it gets too cold. 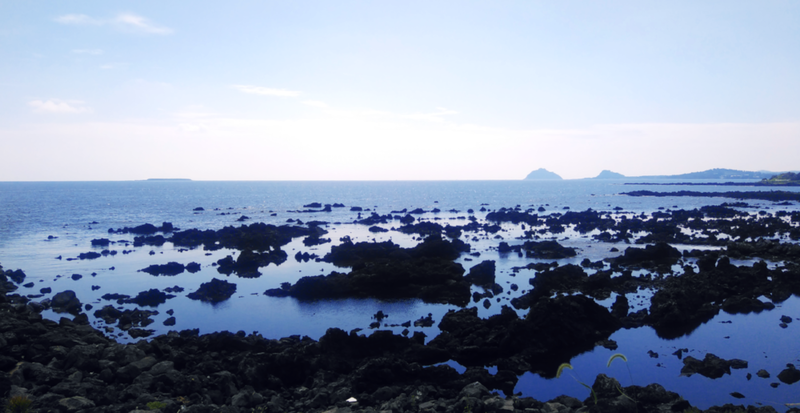 While nature's rhythm remains the same, Jeju is ever-changing. New buildings pop up like mushrooms in the forest after a rainy spell and as soon as you've found your favorite cafe, it will probably move to another part of the island. But the flurry of activity and tourism does calm down a bit in late October and November (after Chuseok is long gone...), presenting the perfect time to discover hidden places and check in with nature. What are the Jeju Olle Trails? ... you might ask. It's a hiking trail network leading around the whole island, for a total of over 20 different routes and 422 km. While they mostly follow the coastline, most of the trails also lead through forests and hills deeper inland, only to then return towards the sea. Lots of guest houses can be found along the hiking trails and invite to make the several days long trip around the whole island. Fall is the best hiking season and there are events like the Jeju Olle Trail Hiking Festival, too. Olle trail hiking is best enjoyed socially with lots of picnic food, or on your own as a solo traveler (South Korea and Jeju especially is famous for its travel safety) with a good camera in tow. After hiking along 5 Gil of the Olle Hiking Trails a couple weeks ago, I was inspired to go back through old pictures, compare the past to the present, and to try and capture Jeju's vibrant colors in my sketchbook. With Inktober around the corner and 30 days of just Thailand travel sketches looking to be both repetitive and intimidating, I happily fell back in love with Jeju's scenery and got caught up in watercolor mixing. Jeju Island presents itself as a patch-work of history and culture. Next to an old stone house you might find a trendy cafe. Tourists crowd the coastal road, angling for the perfect picture spot next to seaweed batches laid out to dry in the sun by the local Halmoni. Rental cars mingle with stuttering trucks on tiny village streets. It's a cacophony of styles and, even more, lifestyles. And not to sound cynic: I love the creative cafes, the art galleries, and the liveliness that tourism has brought to the island (not to even mention the economic upswing, but that's a whole different subject). But sometimes, the tidal wave of tourists can feel out of place and be intimidating when juxtaposed with the calm island life I'd gotten used to during my first two years here - and I enjoy the colder season when "our" remote village feels like just a village again. Going on a hike along some of the less beloved and therefore less busy Olle trails made me fall in love with the nature and roughness of Jeju Island again. Once you leave the manicured-to-perfection picture spots behind and stumble over weeds and rocks to find the next Olleh ribbon marking your way, life calms down immediately. I try to capture that contentedness in my sketchbook. Not every part of Jeju Island is pretty. It doesn't - as is often touted - evoke Hawaii. Run-down old houses, windows re-enforced with plastic tape against brutal typhoon winds, are just as common a sight as the picturesque (renovated) stone houses. Forgotten plastic trash piles up next to the typical volcanic stone walls. After passing by a wide sandy beach promenade, long stretches of fish farms decorate the shore. I don't want to ignore those. Life on Jeju isn't only about idyllic nature, resorts, waterfalls, and a quick trip to escape the bustle and dust of Seoul. There are a wildness and rough beauty to a place that has seen and does still see hardship, hidden behind a thin veneer of recently developed areas. 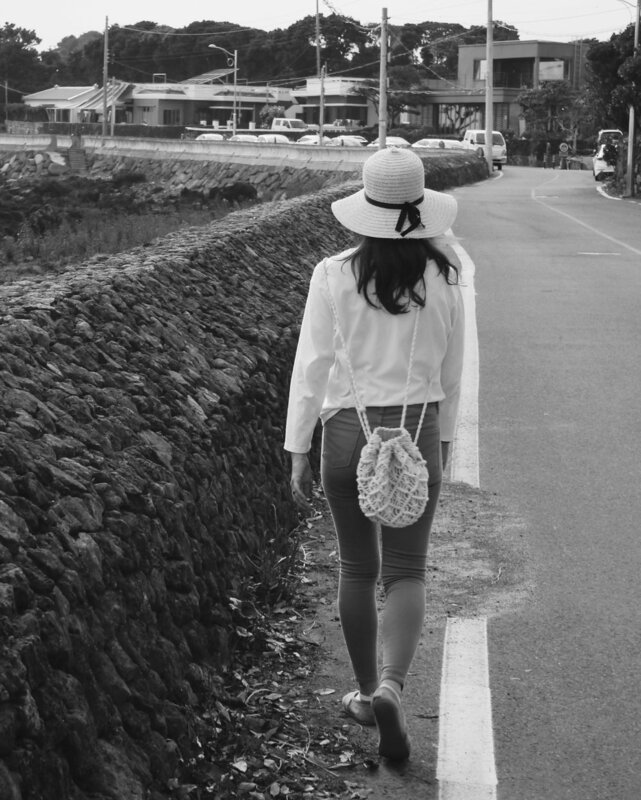 As you walk along the coast, you can see Haenyeo, the diving women of Jeju, swim out at sea and searching for anything from shellfish to octopus. You'll also find lots of traditional restaurants along the way. Before tourism on Jeju Island experienced its latest boom (which started around 2014 and seems ever-ongoing) most restaurants and guesthouses tried to stay near the Olle Gil route since hikers made for the best and most frequent customers. You can stop for the night nearly everywhere along the way, and in recent years, the traditional "Minbak" guesthouses have been joined by more modern and expensive rental places of all forms and sizes, so there should be something for everyone. The starting and, respectively, end points of each route are conveniently located in villages, near famous or historical sites, or at least close to a bus stop, so they're easily accessible to anyone. Most trails are also relatively easy, taking you anywhere from 4 to 7 hours depending on your walking speed and the frequency of meal breaks. Visit one of the 5-Day Markets taking place on the island or the Olle Trail Market in Seogwipo to buy supplies like the famous Jeju Island tangerines or Omaegiddeok, a very filling rice cake variation, then set out for a day of walking. Easy Hiking Routes - Just Enjoy the View! ... and back to the shore again. We encountered other hikers, fishermen, Haenyeo, a whole army of mosquitos, friendly restaurant staff that offered us refreshments despite being closed, more mosquitos, spiders, cranes, cute Jeju dogs, petanque players, and a group of lost tourists. As the sun set, the world turned blue and gold and we enjoyed the last stretch of the hike along Olle Trail 5 with a breathtaking view of Halla Mountain at the horizon. 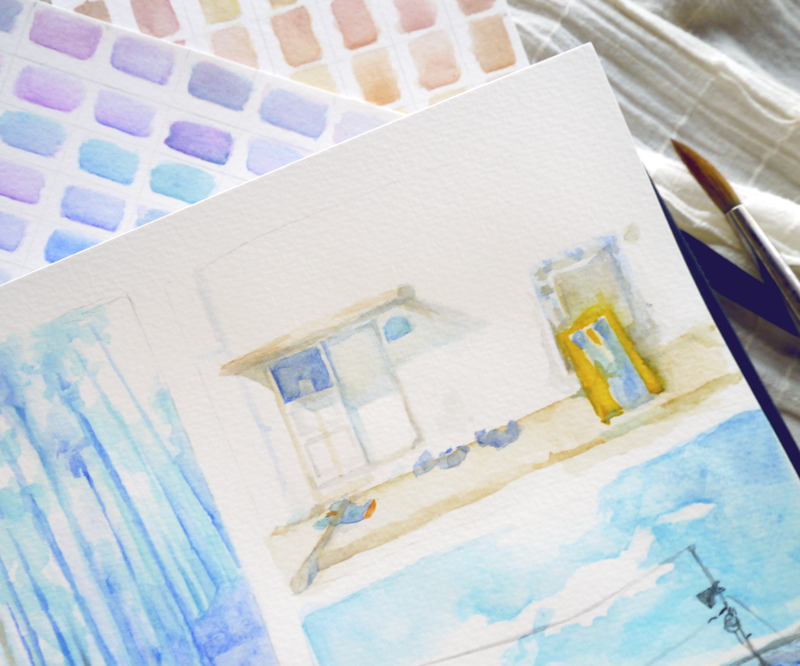 That was the moment I decided on painting Jeju's landscapes in watercolor. 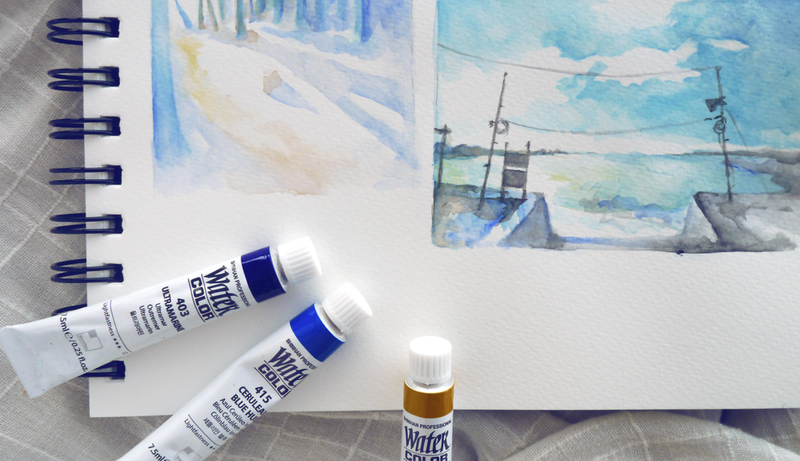 Every season has its charm for painting (or for just living, at that) but I enjoy the soft and warm fall lighting most. It plays beautifully off the white houses with their colorful rooftops, and the sea is a deep azure blue. After hours and hours of walking, we finally arrived at the end of Olle Trail 5! We could have started with Trail 6 immediately (... nope.) but preferred a quick bus trip home to enjoy Makgeolli rice wine and a hearty meal. I hope to continue painting and drawing Jeju Island. I might not always go for landscapes, but document small moments of daily island life, or unique foods and drinks I find along the way. Like the lotus flower tea on that sketch above. The traditional markets here often hold events that showcase traditional ingredients or island customs. If you're interested, you can find out more about arts, crafts, and markets here on Jeju Island in this post. I find it so calming and relaxing, and it makes me appreciate my surroundings. Painting has the same effect of taking a break to observe the beauty around me, big or small, unique or mundane.